RIO DE JANEIRO, BRAZIL – Following the opening night of the Carnival competition in Rio de Janeiro`s famed Sambódromo on Friday, February 5th, the remaining seven samba schools from the Série A will parade on Saturday, February 6th. The Inocentes de Belford Roxo samba school will parade second during the second night of Série A competition on February 6th, photo by Alexandre Macieira/Riotur. 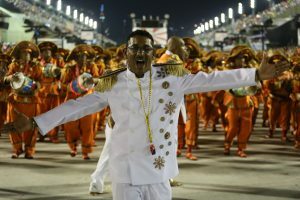 The schedule for the parades during the second night of Série A (formerly Group A and the Access Group) competition from the first samba school to enter to the last is; União do Parque Curicica, Paraíso do Tuiuti, Inocentes de Belford Roxo, Império Serrano, Caprichosos de Pilares, Unidos de Padre Miguel and Acadêmicos do Cubango. Read below to find out more about each school. União do Parque Curicica – The samba school União do Parque Curicica was founded in 1993 in the Zona Oeste (West Zone) neighborhood of Curicica and first paraded in the Sambódromo in 2003 when Série B schools were still included in the Sambódromo parades. Moving up and down among the lower divisions and not yet parading as part of the Special Group during its history, last year União do Parque Curicica paraded in Série A and presented the enredo, “Os 3 Tenores… do Samba!” (The Three Tenors…of Samba!). An homage to famed pop-opera group, The Three Tenors and a tribute to the operas presented by the Teatro Municipal do Municipal do Rio de Janeiro, the procession featured Brazilian Samba tenors Arlindo Cruz, Martinho da Vila and Monarco. This year, the school returns to the theater, paying homage to a different kind type of performer as it presents the enredo (theme); “Corações Mamulengos” (Mamulengos’ Hearts). The Mamulengo is a type of puppet popularized during colonial periods in Northeastern Brazil, mainly in the state of Pernambuco. The town of Olinda, Pernambuco is home to the Olinda o Espaço Tiridá – Museu do Mamulengo (Mamulengo Museum), which features over a thousand pieces and is known to host daily performances. Paraíso do Tuiuti – Established in the early 1950s, the Paraíso do Tuiuti school originated on Morro do Tuiuti and is now based in the neighborhood of São Cristóvão. Moving up and down through the rankings during its history, Paraíso do Tuiuti earned fifth place in the Série A in 2015 after presenting the enredo “Curumim chama Cunhantã que eu vou contar,” based on the famous 16th-century accounts of German soldier and explorer, Hans Staden and his trips to Brazil. Inocentes de Belford Roxo – Formed in the city of Belford Roxo in Baixada Fluminense in 1993, the samba school Inocentes de Belford Roxo has risen quickly in popularity during the last two decades. The school moved into the Access Group (Série A) in 2009 and have maintained their position there since. While Inocentes de Belford Roxo has not yet reached the Special Group, the school is one to watch this year as they present the theme, “Cacá Diegues – Retratos de um Brasil em Cena,” a tribute to the Brazilian film director, Carlos Diegues, also known as Cacá Diegues. Império Serrano – Another school to watch, Império Serrano has won the Série A parade three times and the main Carnival championship nine times since its formation in the neighborhood of Madureira in 1947. Once again led by carnavalesco Severo Luzardo, who helped the school reach 3rd place in the Série A competitions last year, this year Império Serrano will present “Silas canta Serrinha” (Silas sings Serrinha). The theme is a tribute to the area of Serrinha with an emphasis on the poetry of Silas de Oliveira, one of the founders and composers of many of the school’s theme songs. The Unidos de Padre Miguel samba school will parade sixth during the second night of Série A competition on February 6th, photo by Gabriel Santos/Riotur. Caprichosos de Pilares – Established in the Zona Norte (North Zone) neighborhood of Pilares in 1949, Caprichosos de Pilares has paraded in the Special Group fifteen times during its almost seventy-year-long history but has yet to win an overall victory. The school was last in the Special Group in 2006, remaining in the Série A since with the exception of 2011, when it slipped further down into Série B. Led by carnavalesco Amauri Santos, who has worked with the school multiple times before in 2011, 2012, 2013, and 2014, this year the school will present the theme, “Tem gringo no samba” (Have Gringo in Samba). Unidos de Padre Miguel – Founded in 1957 in the neighborhood of Padre Miguel, the samba school Unidos de Padre Miguel won the first parade the school participated in 1959 but have since never made it into the Special Group. In the 90s the school dropped into the C Group and in the early 00s it fell into the D Group and then into the lowest ranked E Group. Then in 2005 the school began to slow surprise many as it steadily battled its way back into the Série A, earning third place in the group in 2014 and runner-up in last year’s Série A competition. If the school’s momentum continues, this could be the year the school wins the Série A championship and finally move into the special group. Unidos de Padre Miguel’s theme for the year will be “O Quinto dos Infernos” (The Fifth of Hells), a fable examining the plights of modern-day Brazilians. Acadêmicos do Cubango – Parading last for the Série A this year will be the samba school Acadêmicos do Cubango. Formed in the city of Niterói in 1959, the school has paraded in the Rio Carnival competition since the 1980s. While Acadêmicos do Cubango is another school that has never moved above the Série A, it plans to change that this year as it presents the theme, “Um banho de mar à fantasia” (The swimsuit a costume). The Special Group schools will parade for the main championship on February 7th and 8th, with six schools parading each day. The winners of the competition will then be announced on Ash Wednesday, February 10th. Be sure to stay with The Rio Times to learn more about the competing schools, winners and additional events during this year’s Carnival.